Yes, there are many secrets of Las Vegas, and that includes homes. I've posted about Dr. Lonnie Hammargren's combined 3 homes that house his unique collection of all things Las Vegas and Nevada, that he calls the Hammargren Home of Nevada History. 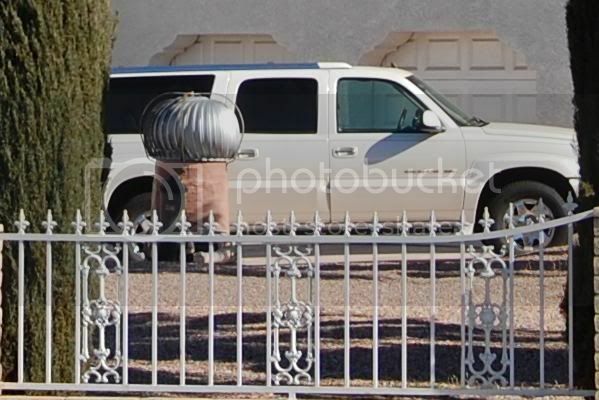 So take a look at this Las Vegas home. Nothing out of the ordinary, just a nice two story stucco on a large lot. 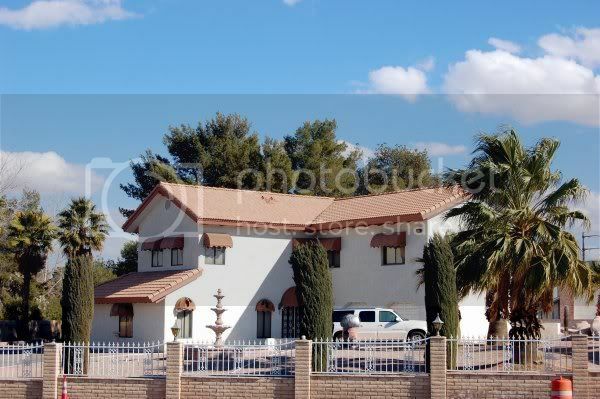 Looks like a typical 4 bedroom, 2 car garage....but it's got a Las Vegas secret. Take another look. There's your clue. Figured it out yet? No, not a nice ride parked there, it's something else.....that turbine vent coming out of the ground. Yes, this home's secret is it's covering another home, underground! No, and not a small one either, it's space is over 15,000 sf. with a 6,000 sf. home! 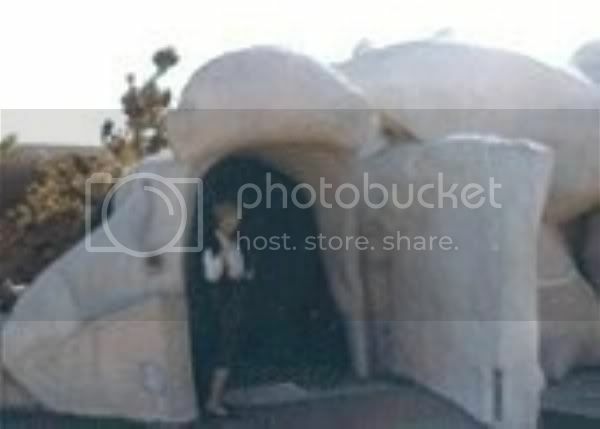 The original home (underground) was built in 1978 by Girard Brown Henderson who had made his fortunes with underground cable TV (Carmel, CA in 1950), Avon and later Gulfstream Aircraft to name a few. He was known as a philanthropist and created the Alexander Dawson Foundation and Schools that provide a traditional liberal arts degree. He was also interested in technology, and with cold war threats he became intrigued with underground living. In 1964 Jerry teamed with two Plainview, Texas subterranean contractor pioneers, Kenneth and Jay Swayze, and built his first underground home at, or should I say under, his 350 acre property in Colorado. That same year he sponsored an Exhibit at the 1964 - 65 New York World's Fair for his newly formed Underground World Home Corporation and covering the topics "Why live underground?" and "How to build underground". That company didn't turn out to be a success and was closed in a short amount of time. It didn't seem to stop Jerry from thoughts of underground living. Fourteen years later he built this lavish 3 bedroom subterranean home here in Las Vegas, equipped with full hand painted (over 3 years by TX artist Jewel Smith) panoramic murals, pushbutton lighting that changed a starry night sky into a sunrise, and an astro turfed and landscaped yard complete with waterfall, heated pool, two hot tubs, BBQ, and guest house. The interior of the home is done in retro 60's 'Austin Powers' style shag and decor, and even includes a pink marble bathroom with glowing pink bathtub! This is all wrapped neatly inside a steel shell with 10" thick concrete ceiling that is earthquake and most importantly, nuclear bomb proof......although it will hopefully never be tested to prove it. When the home was first built, passers by would only see a large, well landscaped desert lot. If they happened by at just the right time, they might see a sophisticated older couple using a remote control.......to open the 'boulder' that housed the elevator to their secret Las Vegas hideaway......literally. It was 25' below ground and self sufficient with it's own generators, HVAC system, and computerized lighting. Jerry passed in 1983 and his wife Mary in 1989. The home was quietly passed on to distant relatives, the newer home built on top of it, and for a short time had been made available for rent for corporate functions by then owner Thomas 'Tex' Edmondson. Unfortunately that is no more as the home changed hands again in 2005, and there are no public tours and the talk of it being turned into a museum seems to have disappeared. It's even an unwritten law for Vegas locals not to divulge the secret location, but I will dispel that one myth that often comes up.....it is NOT under a casino or on the Vegas Strip.......obviously. I also have to wonder if the 1998 comedy "Blast From The Past" starring Sissy Spacek, Christopher Walken, Brendan Fraser, and Alicia Silverstone had at least some inspiration from this unusual Las Vegas secret abode. Wow Roberta, I learn something new every day...I had no clue about this house. Interesting stuff! Wow. It is amazing this home. 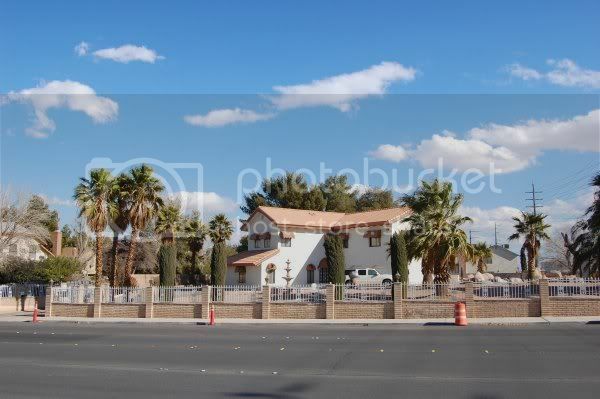 Are there any more homes like this in Vegas? Mary: There is always something new to learn in Las Vegas. Katerina: Blast from the Past was a cool movie. Steve: Always something interesting in Vegas. Hi Roberta: That is just totally amazing. Texas is supposed to be able to top just about anything, but that goes out the window with this incredible home. Thanks for sharing. Karen Anne: It is an amazing home. Glad you enjoyed it. Roberta- That is so cool. Here in Florida, it would fill with water. I like the idea of the cave entrance. My wife would not live underground. But I could. Wow, that's pretty unique. I love the "yard" idea. I'm just not so sure I could get into the whole living underground thing, but it is interesting. Since Sissy Spacek lives here in our area I will ask her next time I see her at the mall. Roberta, I remember seeing this on HGTV when it aired and I thought it was so unique. Not a bad idea really. We need them here in Texas because of the tornado threats! Mark: I don't think I could live underground but it would be great to visit. Jesse & Kathy: It is very unique! Charles: Let me know what she says! Linda: That would be a great idea for you in Texas. Great post! I enjoyed reading it. That is very interesting. I think every city and suburb has some little secrets like that. Thanks for sharing. Alan: Glad you enjoyed one of our secrets! This is a great post! You are INSPIRING me to hurry up and get my favorite places up and on my blog. Like my favorite French Bakery, locals spots, etc. Denise: Well, get out there and start posting those favorites! I will be watching for all your posts. Having grown up in this city I can remember when that house on top did not exist. You drove by the property and all you really saw were a bunch of large boulders. But, almost everyone knew there was an underground house there.